The Van Rijn lab is very willing to share our expertise and resources through collaboration. We have the equipment and technological expertise to perform a variety of molecular, cellular and behavioral assays. A selection of these techniques and assays that the lab currently runs is provided below. If you are interested in starting a collaboration, please contact us. Cis-Bio Fluorescent ligand displacement assays (measured in 384-well format using Flexstation 3). Promega GloSensor cAMP assay (measured in 384-well format using Synergy4 and Flexstation 3). DiscoverX pathhunter β-arrestin 1 and 2​ recruitment assays for delta opioid receptors and β-arrestin 2 recruitment for mu opioid receptors and for kappa opioid receptors (measured in 384-well format using Synergy4 and Flexstation 3). Figure: Pharmacological characterization of the DOR agonist DADLE. A. Displacement of fluorescent naltrexone. B, Inhibition of forskolin-stimulated cAMP. C, Recruitment of β-arrestin1. D, Recruitment of β-arrestin1 by DADLE. ​Heterodimer calcium mobilization screening assay (measured in 384 well format using Flexstation 3 using FLIPR6 calcium assay kit from Molecular Devices ). Figure: Heteromer selective assay for Gi-coupled (and Gs-coupled) receptors. Fusing A chimeric Gqi4 (or Gqs4) protein to a truncated GPCR like the delta opioid receptor (DOR) prevents calcium signaling from the delta opioid receptor homomers. co-expression of a Gi- or Gs-coupled wild-type receptor, like the mu opioid receptor (MOR) can rescue calcium signaling through the chimeric protein. Importantly, homomers of the wild-type receptor are unable to induce calcium signaling as it signals through Gi or Gs and there is no free Gqi4. Point mutagenesis, introducing of tags, cloning of fusion proteins. Digital fluorescence microscopy for imaging receptor signaling and trafficking (using a Iris digital fluorescence microscope). Figure: Viral knockdown of spinal mu opioid receptors (MOR) in conditional floxed MOR C57BL/6 mice. Floxed MOR mice were intra-thecally injected with AAV-GFP or AAV-CRE-GFP. Mice were perfused three weeks after injection and imaged for viral infection at 488nm. 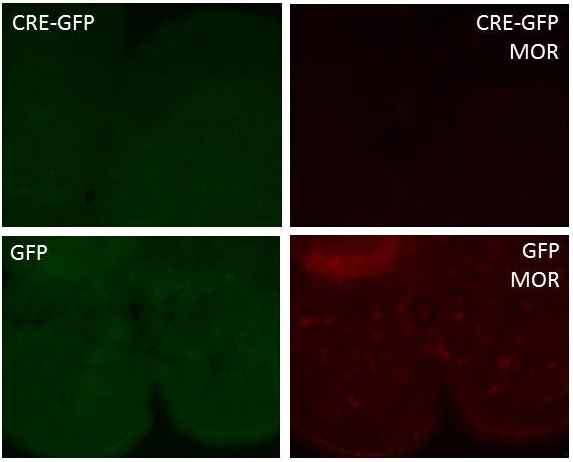 Mu opioid receptor expression was detected following immunostaining with a primary rabbit anti-MOR antibody (Immunostar, #24216) and a secondary goat anti-rabbit alexa594 antibody. Figure: Lentivirus driven expression of Beta-arrestin2-cherry in NG108-15 cells. NG108-15 cells endogenously expressing delta opioid receptors were infected with lentivirus containing beta-arrestin2-cherry. The lentivirus was produced using the virapower system with the beta-arrestin2-cherry expression behind a CMV promotor. Thermal analgesia using a Radiant heat tailflick apparatus (Columbus instruments) or Hot plate (Columbus instruments). Models for opioid dependence and tolerance. Mechanical analgesia using Von Frey filaments. Models for alcohol withdrawal induced hyperalgesia. Alcohol induced Loss of Righting Reflex (LORR). Models for anxiety-like behavior using dark light transition boxes (Med associates) and elevated zero maze (Clever Sys). Models for depression-like behavior using Tail suspension boxes (Med associates) and Forced swim recorded by videotracking software. 2-bottle choice self-administration using double grommet animal cages (Allen town). Induction of inflammatory pain using complete Freund’s Adjuvant. Induction of drug place preference or aversion using 2-chamber conditioned place preference inserts into locomotor activity boxes (Med associates). Stereotactic infusion and cannulation of mice (using a KOPF 1900 digital stereotax). 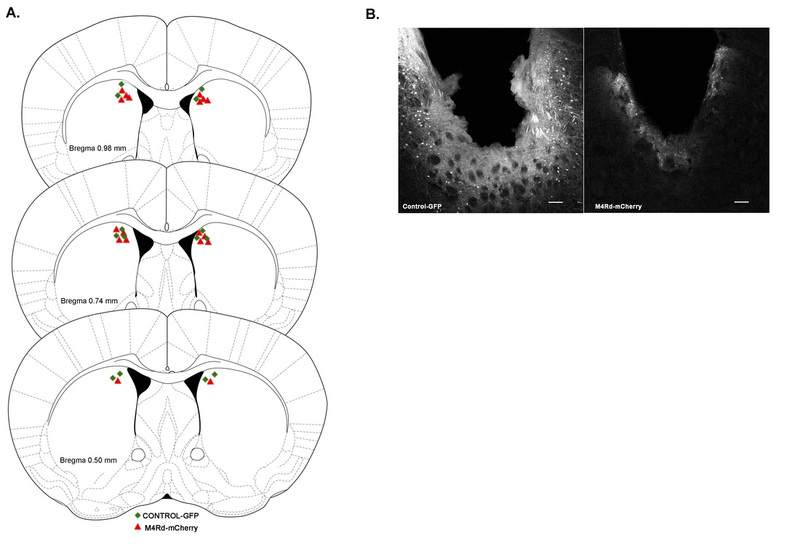 Figure: Viral infusion of AAV-GFP or AAV-M4Rd/cherry into the dorsal striatum of C57BL/6 mice using steraotactic surgery.